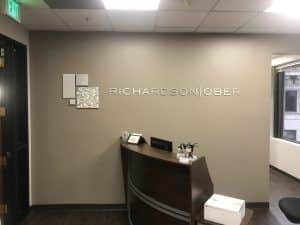 Richardson|Ober’s Pasadena office reached out to us for a new sign for their reception area. We had made a couple of logo signs for them a few years back, but they made some changes to the logo and needed to have a new logo sign made due to the update. We had originally made one sign for their reception area and another for the elevator lobby, but they decided to just go with the reception area sign this time. 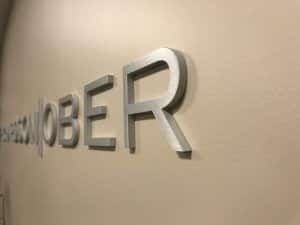 As you can see from the photos, we made the sign from aluminum dimensional letters and used different finishes on different parts of the logo. Although we had been to their office before, they were renovating and moving the sign location so we went out to the location to get measurements of the sign area. They also provided us with a rendering of what they were considering for the lobby sign along with samples of colors they were considering for the wall and their logo file to help us design a sign that would look good in the space. 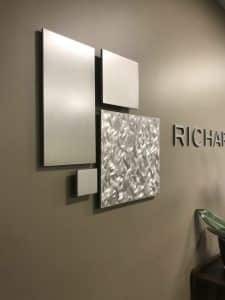 They were initially considering two identical signs, one for the reception area and one for the elevator lobby, but they decided to just get the reception area sign. Although their initial rendering included the colors of their logo, they wanted to explore metal options also so we provided quotes for painted acrylic, aluminum, and anodized bronze letters. They decide to go with aluminum, and we decided to use different metal finishes on the logo panels to reflect the different shades of red that are used in the logo. We also installed the logo panels with varying lengths of spacers to create more dimension. 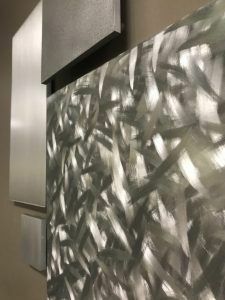 No matter what your logo looks like or the colors that are used, we can make you a custom lobby sign that will look good with your interior decor.